What is Skin Cancer Treatment? Skin cancer is a common diagnosis among Australians with two out of every three people obtaining some sort of skin cancer diagnosis by the time they reach the age of 70. It is a frightening disease for many people since skin cancer left unchecked can be deadly in some cases. Even tumours that are not life-threatening can be concerning from both a medical and a cosmetic standpoint. In the process of eradicating cancer through surgical techniques, individuals may be concerned about the type of scarring that might be left behind. An experienced specialist plastic surgeon will ensure the malignancy is appropriately treated while producing the best possible cosmetic result. What is Skin Cancer Excision? Excision refers to the elimination of a skin cancer tumour by cutting it out of the skin and tissue. When the mass is determined to be malignant, excision will also involve the removal of tissue surrounding the tumour, known as a margin. This will ensure all the cancer cells are removed to reduce the risk of a recurrence after the excision is completed. The precise amount of margin taken will depend on the size of the tumour and the specific type of cancer that is present. This technique is sometimes referred to as wide excision or elliptical excision to indicate the shape that is created during the surgery. An oval shape is the easiest to suture closed, leaving you with the smallest possible scar after the procedure. Tissue removed in the margin is sent to the lab to be sure all the cancer cells were removed from the area. If there is a question about whether cancer cells might remain, additional treatment may be required. Considered the least invasive type of skin cancer in most cases, these lesions still may grow enough to become disfiguring in some cases. Because they are usually formed through repeated sun exposure, they also tend to appear in visible areas like the face, head, neck, shoulders, and chest. Surgical excision is usually sufficient for eradicating this type of cancer but care needs to be taken to ensure the best possible cosmetic result. This type of cancer also frequently appears on visible areas of the body that are exposed to the sun regularly. These tumours can become quite deep and, in some cases, can metastasize or spread to other parts of the body. Early diagnosis is essential to ensure the most effective treatment and cosmetic results, as well as to prevent the spreading of cancer. Melanoma is the most dangerous type of skin cancer and early detection and treatment are essential to a good prognosis. 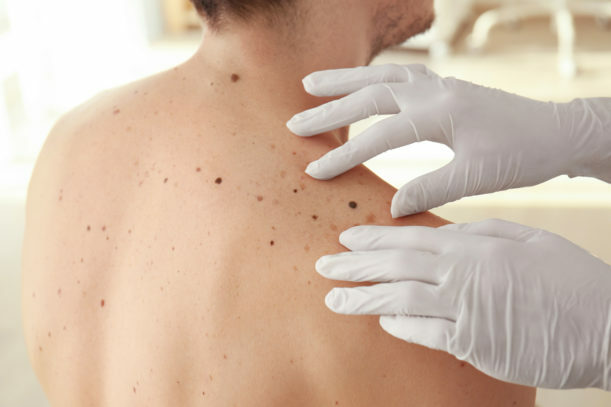 Melanoma in the early stages may be treated through surgical excision, although the margins used to remove this cancer will be much wider to ensure no malignant cells remain. This approach tends to work best on melanomas with somewhat defined borders so that the margin can be better determined. An elliptical incision is the most common method of removing smaller tumours. The wide incision is closed with suture, perhaps layering the stitches to create the best cosmetic result. Flap procedures may be required when a more sizeable tumour is removed or in areas like the face, where there might not be enough remaining skin and tissue to create a natural look by suturing alone. During this procedure, a small flap of skin is cut and moved over the incision area to fill in the gap between the edges of the skin. A portion of the flap is left attached to its original location allowing for blood flow into the flap to ensure the best possible healing of the area. Skin grafting may be recommended for areas where suturing or a flap procedure is not sufficient. In this case, a small piece of skin is removed completely from another area of the body. It is then grafted into the defect that has been created by the removal of the skin cancer. Blood vessels will need to then slowly grow into the graft over time which then leads to take of the graft. At Niche Plastic Surgery, we understand the anxiety and uncertainty that surrounds a skin cancer diagnosis. We offer what is known as “see and treat” lesion removal, which means we will handle the examination and the surgical excision during the same appointment whenever possible. In addition to peace-of-mind in knowing the lesion is addressed right away, this approach eliminates the need for multiple treatment sessions, saving our patients both time and money. Simple excision procedures are performed at our office at Niche Plastic Surgery using a local anaesthetic to ensure patient comfort throughout the procedure. If a flap or grafting procedure is performed, it will be done by one of our surgeons in an accredited hospital as day surgery. In both cases, patients will return home the same day, with precise instructions on how to care for their incisions to prevent infection and ensure the best possible cosmetic result. When you require treatment for skin cancer, you want to ensure you can eradicate cancer while preserving your appearance as much as possible. Experienced specialist plastic surgeons, such as the team at Niche Plastic Surgery, are experts in the proper surgical, and non-surgical, management of skin cancers that will produce a positive cosmetic result without compromising your treatment in any way. To schedule your examination or receive more information about skin cancer surgery, contact Niche Plastic Surgery today on 9853 9705.